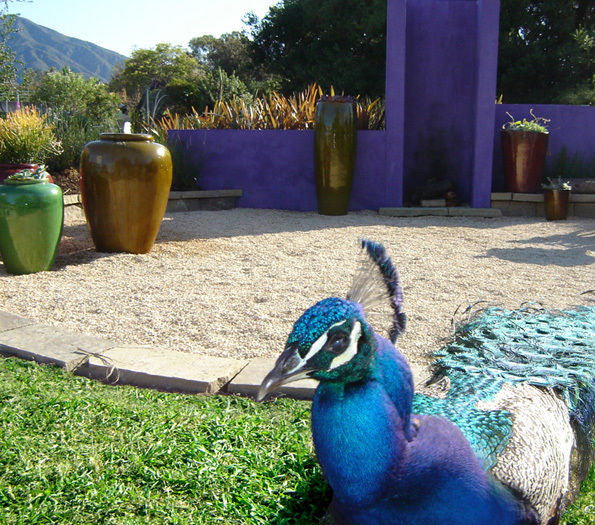 The ambiance of this private nature lovers preserve is vibrant, uncluttered and Peacock approved! 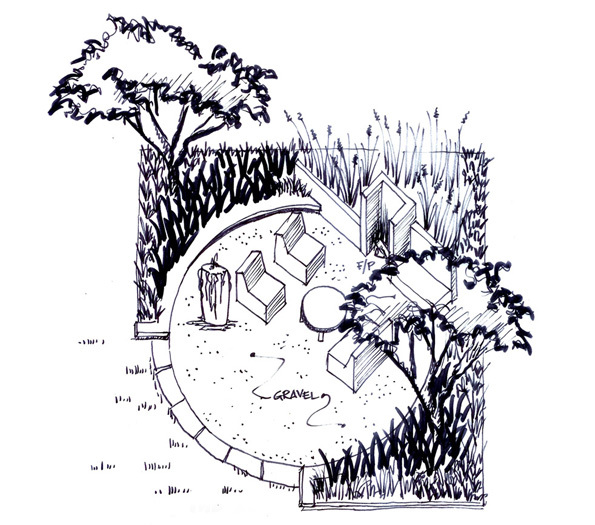 The circular step-down garden is set beneath the shade of majestic native oaks with a soft, golden gravel patio. 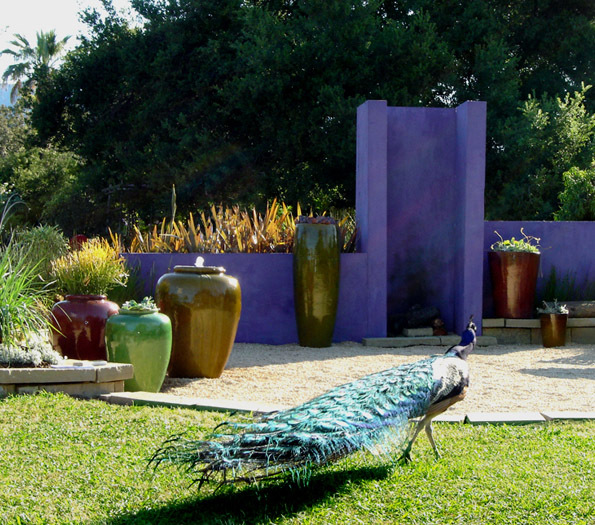 We created a fresh modern garden for this glamorous client, Baron Von Peacock, featuring ornamental grasses, attractive strappy-leafed plants and other beautiful drought tolerant natives. The focal point is a free-standing fireplace made from fly ash and a colorful stucco; the indigo was coined Zanzabar –evoking images of exotic royalty and festive mood. Contemporary Capri chairs and a driftwood table with a round glass top (not shown) compliment the theme and invite long conversations by the fire. 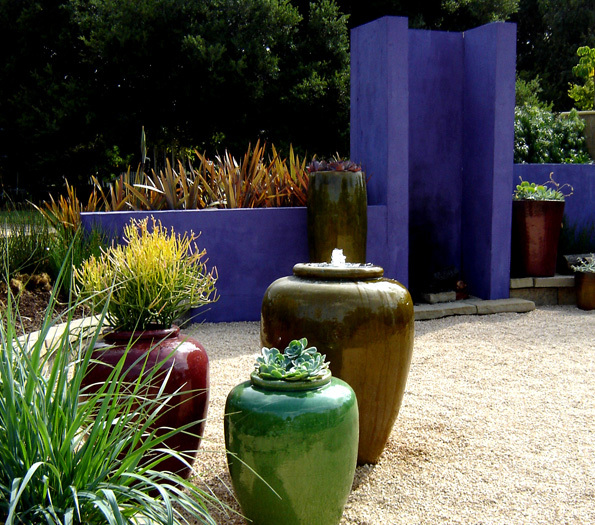 Overall -- stunning, eco-friendly, water-wise, low maintenance; A perfect example of art and sustainable garden design blending seamlessly in harmony with nature. And NO weeding necessary, thanks to the landscape cloth lining below the gravel patio and walkways. In other areas, adjacent to this vignette, use of 3″ mulch keeps weeds to a minimum and retains soil moisture. These lush, beautiful drought tolerant native plants require far less irrigation, fertilizers, chemical herbicides and pesticides than today's common thirsty and polluting lawns. No noisy mowing necessary. 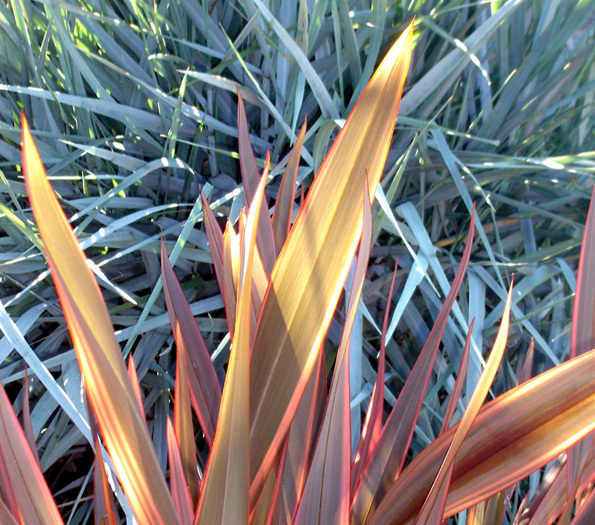 Natives and S. African plants with little water needs greatly reduced lawn area. The free-standing fireplace is made from fly ash rather than traditional cement, resulting in a 50% reduction of greenhouse gas emissions. The colorful stucco is low VOC (volatile organic compounds) and eco-friendly. "Warm" and bright LED lighting uses 1/20 of the energy of traditional lighting and complies with "Dark Skies Initiative". Contemporary Capri chairs made of a wood composite derived from recycled milk jugs and wood pulp completes this "green" garden.